I stepped off the plane in Harare, Zimbabwe, and down through the glass-enclosed walkway overlooking the nearly empty terminal, down into the dark corridor and on to customs. It was a quiet night in the Harare airport, and I was fortunate to be one of the first to deplane. I come about quarterly, and am here this trip reviewing our programmatic progress for an HIV prevention grant. On my trips, I look forward to the very slight changes that are inevitable here – the change in the brilliant colors of Harare from the beautiful violet Jacaranda or flaming red African Tulip trees blooming, the new construction of roads as the country continues to pull out of economic recession, the change in menu items or services at the hotel as it continues to strive to keep up with an ever-growing global business clientele, or the changes on my own program – meeting new staff members and partners as we continue to scale up our program. This time, as I walked down to customs, the change was slight but more immediate – my path out was blocked by a small, tired-looking wooden desk. The desk was flanked by two pretty, young, Zimbabwean women. I approached, glanced back at the long line growing quickly behind me. “Hello,” she said quietly, almost as if under her breath, as she reached out for my passport, “Have you traveled to West Africa in the last 3 months?” “No,” I responded. “Any fever or chills?” Again, no. She thumbs quickly through my passport, hands it back and replies, “Have a nice visit.” I am sent on my way. This is the extent of the Ebola screening here at one port of entry into Zimbabwe. I walk away wondering. 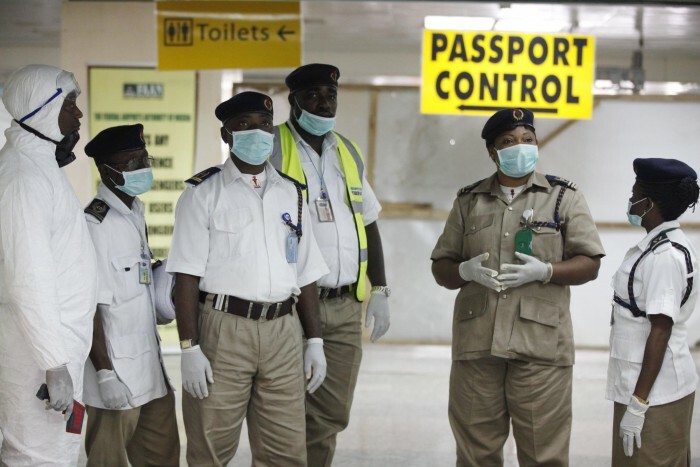 Ebola has taken hold in four West African countries to date – Sierra Leone, Liberia, Guinea and Nigeria. Ebola is a terrible disease, with the last outbreaks being near fatal to all who contracted it (~90% of patients died.) This outbreak the fatality rate is around 50%, though it is believed there is significant under-reporting of cases. As of today, the US Centers for Disease Control (CDC) reports there are 6,263 cases with 2,917 dead in this current outbreak. Ebola has a 21-day incubation period, with the average of developing symptoms between 8-10 days. It is contracted by coming in contact with bodily fluids, including sweat, of someone who is sick and showing symptoms, or even dead. It’s unknown how long the disease can remain contagious in someone who has died, but believed to potentially be months. The progression of the disease is causing widespread mistrust of governments, health officials, doctors, nurses, even aid workers, neighbors and friends. The disease is so terrifying it is pitting people against each other. Last week eight health educators were murdered as they were trying to distribute materials about Ebola, and just today, a Red Cross burial team was attacked in Guinea. Economically, the impact is significant, with many flights cancelled to/from the infected countries, and many companies cancelling all non-essential travel. Here in Harare, 98 people are currently under 21-day quarantine for traveling to Ebola-outbreak countries. Today, I had the pleasure of sitting with some of whom I consider the greatest, most compassionate minds in the world – our staff and partners here in Zimbabwe working on an HIV/AIDS grant. Many of these individuals have dedicated their careers to public health. Most are Zimbabweans that have weathered colonialism, revolutionary war, independence in 1980, the same government for 34 years, economic crises and hyperinflation, and the ravages of the worst global pandemic of our lifetime to date (at least here!) HIV/AIDs, that has stripped people of many loved ones. My colleagues are doctors and nurses themselves, and come with a lot of expertise. It didn’t take long before the lunchtime conversation turned to Ebola. This disease is on the minds of everyone here, including me. We talked about the rapid progression of the disease both in epidemiological terms and rate of spread; we talked about social and economic impacts it must be having on those countries; we talked about how horrific it must be on an individual level. We talked about the terrible, gut-wrenching stories we had heard about – the moms who hid their children when they were sick, the doctor who contracted the disease from a dead pregnant mother when he surgically removed the dead baby, because culturally you cannot bury a baby in utero. We talked about the sacred burial rituals that are in juxtaposition with the protocols of burying an Ebola victim. We talked about Zimbabwe, and how it could unfold here. While Zimbabwe has an incredibly dedicated and passionate core of public health officials, and one of the strongest, most responsive Ministries of Health in sub-Saharan Africa, there is no denying Ebola would be an incredible challenge for this resource-taxed country to contain. The small wooden desk and two young screening ladies at the airport seem woefully inadequate, and yet, how else does a country handle this without creating widespread panic and chaos? My mind can’t help but move from the small wooden desk to small wooden boxes. This country has already had to dig too many shallow graves due to AIDs. Zimbabwe, like much of Africa, does not have the resources, systemically, human or financial, to deal with such a disease. It has the potential to devastate this beautiful and fragile country. In really thinking about all of the ports of entry in the United States and the mobility of the global population, I don’t frankly believe we in the U.S. do either should CDC’s predictions be accurate. Yes, God must be punishing “those” people. “Those” people are my people. And your people. And according to the CDC this week, God must really have it in for all of us. Ebola isn’t a disease that can be blamed on “inappropriate” sexual behavior, or drug abuse. There are no pious ways out of this pandemic. There is no discrimination in contracting this disease, only in the care and treatment. I have gotten the question many times leaving for this trip if I am scared, if I am traveling near to Ebola sites, if I will stay safe. The risk of contracting Ebola this trip is incredibly small – minuscule, really. But, if the CDC modeling is correct, it may not be such a small risk next time, or even to us at home. The risk to our programs here is potentially not so small. And the risk to my friends and colleagues is heart-wrenching. Those that know me, know I am not a fatalist. I come with a can-do attitude and a true belief in the triumphant human spirit, and the core foundation to help others. There have to be solutions to the issues at hand. There has been surprisingly little written in the global media about ways people can help – so here are two ways that don’t require you to put your own life at risk to care for others, but together, I believe we can have a significant impact on the populations that need us the most right now. I’m hoping you will 1) consider contributing financially, and 2) reach out to your public officials to impress upon them to act swiftly. Together, we can do this. If we can raise millions for ALS by sending a viral ice bucket challenge over a period of months, we can do the same, or better, for something with the potential to be much more globally devastating. One of my very wise, seasoned physician colleagues doesn’t believe that we can “small change” our way out of this one, that donations to individual humanitarian organizations won’t curtail the coming pandemic, but rather that it requires a massive multilateral response from foreign governments, including mobilization of top public health officials along with military backing. Perhaps he is right. I think we can do both, so please reach out to your public officials also, and urge them to help. We need every one. The Jacarandas are beginning to bloom here. Brilliant violet foliage makes the city look like it’s been dustily airbrushed into a painting with a purple backdrop. It reminds me how gorgeous the world can be, even with such deep suffering. Marrianne works for the International Training and Education Center for Health, based in the Department of Global Health at the University of Washington.